Tonicity is the reason why salt water fish cannot live in fresh water and vice versa. 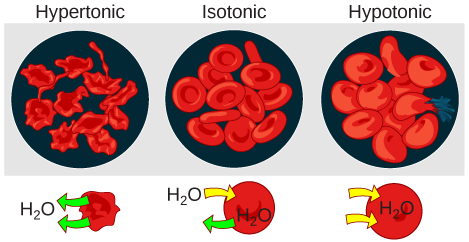 A salt water fish’s cells have evolved to have a very high solute concentration to match the high osmolarity of the salt water they live in. If you place a salt water fish in fresh water, which has a low osmolarity, water in the environment will flow into the cells of the fish, eventually causing them to burst and killing the fish.